I can’t tell you how many articles I have read that at some point recount the many iterations Star Trek has seen over its 45 year history. I’m pretty sure every lousy one of ‘em has claimed that the franchise includes “five TV series.” And every one of them has been WRONG. There are SIX series, people. Recognize! 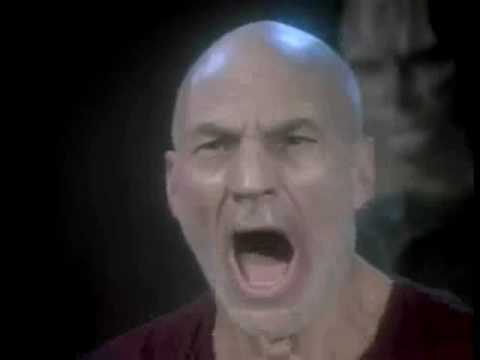 My dear, beloved Star Trek: The Animated Series, why do they hate you? Why do they scorn you, pretending you don’t exist? The Animated Series is brilliant, folks. It wasn’t just some rip-off kids’ show. It was Star Trek. All the same actors (except Walter Koenig, the victim of a small budget) reprised their roles from TOS. Many of the same writers returned, including D.C. Fontana and David Gerrold. Several of the series’ new writers had already been slated to write Star Trek episodes or had wanted to write for Star Trek before the first series was canceled. In the Animated Series’ DVD special features, Fontana describes the mindset behind the scenes and says that cast and crew were setting out to do Star Trek, not to make some cutsey knock-off. They approached this series the same way they approached TOS. Of course, there were significant differences which presented new challenges, but these often opened up new opportunities. The series is short – just 22 episodes – and each episode is 30 minutes in length. This made for much more efficient storytelling with less exposition. Its quicker pace delivers a lot more excitement with stories that are just as interesting. The fat has certainly been trimmed, often for the better. Almost halfway through the series, I realized I hadn’t seen a single turbolift ride – and I hadn’t missed them at all. In the Original Series, sets and costumes were frequently borrowed from other productions at Desilu and Paramount in order to cut production costs. This resulted in sometimes interesting but often painfully silly “Earth analogue” episodes (as I call them). Instead of encountering anything resembling an alien on anything like an alien planet, the away team would meet humanoids living on, say, a 1930s Chicago gangland planet, an avant-garde Old West set pieces planet, a Nazi Germany planet and so on. While some of these episodes still manage to be fun and even thought-provoking, it’s terrible to see good writers hobbled by such contrivances. Not so in TAS. Here, our intrepid Trek writers could imagine aliens that looked like Aztec snake gods or weird, wormlike Snuffleupagi, or, as in the famous David Gerrold-penned episode “BEM,” a being who could dismember himself at will and operate his body parts independently. Really great, crazy ideas could be spun and, “voila!” there they would be in the finished episode. At the same time, we get to meet countless new characters and marvel at the talent ofJames Doohan (who voices over 60 of them!) as well as learn about Spock’s childhood on Vulcan. The adventures are exciting and fun and the series as a whole (yes, I’m saying it) is more consistently enjoyable than TOS. Unburdened by the constraints of live action and the orders of up to 29 episodes in a season, TAS managed to produce 22 consistently good episodes with only a few weak turns over the course of two years (1973-75). By simple percentages, TAS is the stronger of the two series. Still, people everywhere behave as though this series doesn’t exist or “doesn’t count.” To my surprise and dismay, this seems to even include StarTrek.com itself! Today, I was happy to find that the site was drawing attention to TAS. Arrrgh!! NOOOOO!!!! >sigh.< Two steps forward, one step back. Come on, StarTrek.com! You just mentioned the Animated Series. Can you forget so quickly? Now, I’m sure many people will say that the five series count is a technicality. But this is really just an excuse to overlook “the cartoon” so Star Trek looks less like a kids’ show. There are a couple of ways this slight of hand is done to try to make a genuineTrek series disappear. Some will claim that TAS is “not canon.” Like it’s somehow “unofficial” Star Trek. I can understand saying that about the many comic books and countless novels that spin their own Star Trek yarns without the scrutiny for consistency and continuity applied to the TV series and films. But this show was run by the people in charge of the canon! It also established things that are part of Star Trek history. 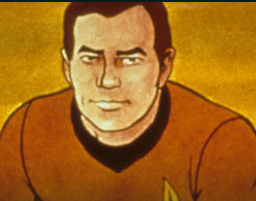 Every time you call Captain Kirk “James Tiberius Kirk,” you can thank TAS. His middle name was established there. Aside from that, the Animated Series was still its own project with its own character, its own accomplishments and a great many differences from the Original Series. It deserves to be recognized and it deserves to be given its rightful place in Star Trekhistory. It is the second in six TV series. It’s The Animated Adventures of Gene Roddenberry’s Star Trek. And it’s really quite good. Check it out at StarTrek.com or Hulu or buy the DVD. It should be in every Trekkie’s collection. Because it’s Star Trek. Own it. Haven’t gotten around to finishing the season though. Perhaps it’s time to put Stargate on hold for a bit. Stargate?? It’s time to put your LIFE on hold. This is Star Trek: The Animated Series we’re talking about! But good on ya for owning it. Finally watched the first episode of TAS on Netflix, and it was really good, although the end tended to drag on a little bit. I think one of the reasons I had avoided TAS in the past wasn’t because it was a cartoon but because I thought I had already read all the stories, as they were collected in many of the Star Trek Log books which I read as a kid. The Log books were the first Star Trek books I ever read, and loved them, before eventually moving on to TNG books, DS9, etc. Haven’t read a Star Trek book in about five years, though…shame. Now, something else you mentioned. Is TAS the fourth year of the five year mission? I’m not certain. This is definitely a canon debate, and most people tend to follow Gene’s rule that if it’s not on film/tape it’s not true canon. That works to an extent, but I do think there needs to be some grand loremaster of Star Trek who can definitively say whether something is canon or not, and we have a rather significant gap of time between TOS and TMP. I think TAS should indeed be considered canon, but we need to make allowances for the 25th Anniversary PC game stories as well as The Kobayashi Maru PC game stories. I also think that the great DC comics of Star Trek, especially the ones that fit in between Star Trek IV and VI, should be considered canon, as there is some great material there. Wrapping up…my interest in Star Trek has waned considerably in recent years, but I’m still very much into it it seems. …although now my anger about Stargate Universe being cancelled is coming back…lol. I’m glad you enjoyed it! I’m pretty sure TAS is year four. Memory Alpha (on the Links page) could probably clear it up. They seem to include TAS as canon. And I don’t hate Stargate. I just have my priorities. I’ve seen most ofSG-1, a lot of Atlantis (which I enjoy, but not as much) and SGU…You mean BattleStar GateLactica?